Gold trading continued its sideways price action last week, although we may see a modicum of activity enter the gold market given the likelihood of some serious dollar decline this week as evidenced in the usd index. The spot gold price ended Friday’s gold trading session marginally below the 9 day moving average which appeared to cap the attempt to rally. 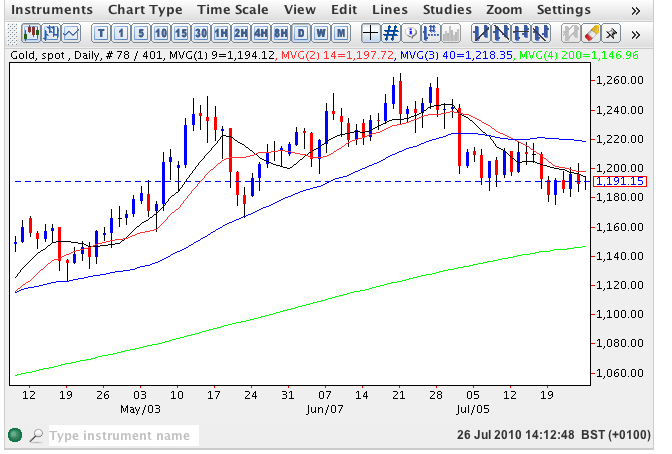 For gold bulls this week the key price level remains $1217.75 with any break above here signalling a breach of the short term price congestion, coupled with a break of the 40 day moving average and should these factors combine, helped along by usd weakness, then we should see a run on towards $1250 per ounce in due course. As has been said many times before the longer term outlook for spot gold remains firmly bullish.